Session presented at the first international conference dedicated to the management of software and software-intensive products: Software Product Summit – April 17-18, 2018 in Frankfurt, Germany, by Katharina Peine. The software product manager needs to manage the product to achieve sustainable profits. Especially in a fast-paced environment such as the software industry, it is necessary to differentiate significantly from competition. The Blue Ocean Strategy is a model to shape market boundaries or even create new markets by changing the product definition and value proposition. It provides a conceptual framework and as well a 7 Step Method how to approach this (see Kim and Mauborgne (2017): Blue Ocean Shift). Blue Ocean Strategy and the 7 Step Framework can support the software product manager coming up with radically product innovations. Competitive analysis is an important task within the software product management to provide a successful product strategy. Using the Industry Method the software product manager can identify direct competitors in the existing market with virtually identical products. On the other hand, the Market Method supports him to identify indirect competitors and to come up with different products to resegment the existing markets or even other alternatives with different products (i.e. do-nothing/do it yourself) to create new markets. To achieve a dramatic improvement of the company’s value proposition, the software product manager would be more successful using the Market Method to identify offerings that fulfill the same need, maybe in a different way. Therefore, the Blue Ocean Strategy is an outstanding tool. Starting with the distinction between the different approaches of competitive analysis (Industry Method and Market Method), in the software industry it is important to differentiate from the competitors and to create innovative product ideas. Blue Ocean Strategy is presented as a tool that can support the software product manager precisely in this challenge. 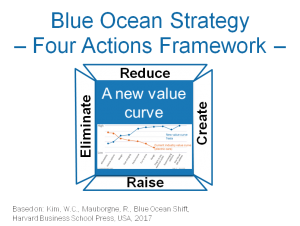 One feature of the Blue Ocean Strategy is to redefine the existing value curve of a product and to fill out the four actions framework with the eliminate-reduce-raise-create-grid that supports to change value factors of a current industry value curve (see Kim, W. and Mauborgne, R. (2008), Blue Ocean Strategy: How to Create Uncontested Market Space and Make the Competition Irrelevant). If you want to hear more, please let me know and send me an e-Mail or visit my session at the Software Product Summit (registration).